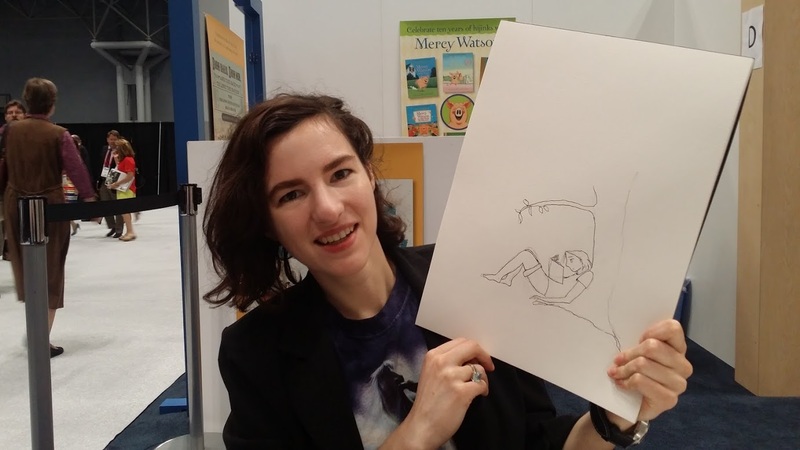 ShelfNotes was thrilled to get the chance to interview Maggie Thrash at BEA this year for her upcoming comic/graphic novel “ Honor Girl” publishing this Fall with Candlewick Press. Maggie completely knocked us back when we saw her - she looks very much like her depicted self in the comic. Before we got to meet her, she was in a comics panel earlier on, when we asked her about it, she referred to it as the panel with “me and the dudes”, which was spot on. Comics have this way of being able to present yourself, she mentions being able to show - “this is what I look like, these are the sorts of things I say and you can watch me and be with me” and how this process is much more objective. Thinking on that, it would be really uncomfortable to have to describe yourself in that way, or even environments. Even though it might sound easier to write about yourself through a comic format, one could imagine how hard it would be to draw yourself and to convey emotion and expression. Maggie does this so well with her sparse drawings, just a circle and an eyebrow for an eye conveys so much. Speaking of art and drawing, a look at Maggie’s website (her older one) gives you a feel for her roots. She says it’s fun to look back and see that was the best she could do then. When questioned if she wanted to tackle the illustrations herself, she told us a great story that had her fall into Candlewick’s lap. While Maggie was shopping around for publishers, one (who she states will remain nameless) said ‘we like this story, will she hire an artist?’ and her agent stood up for her and said, “No, we’re not even considering that.” Then Candlewick came around and Maggie describes her love for them as “just all new best friends”. I think we can all agree Candlewick is a very special press. After a small chat about the color in the finished book (we read black and white galleys), we came to discussing the cover (which we love). Maggie admits that she can’t take credit for it, even though she did the drawings. Hearing this made us automatically think of the Kirkus review and how much they nailed it with this line, “She has so carefully and skillfully captured a universal moment—the first time one realizes that things will never be the same”. We got very curious as to how her family was handling this comic with them featured in it. She said her brother has handled it well but her mom asked if she could change her name… which left Maggie a little speechless because what else could she call her but “Mom”? Her brother plays a charming part in the comic and we absolutely adored him, we can only hope they collaborate on something in the future. 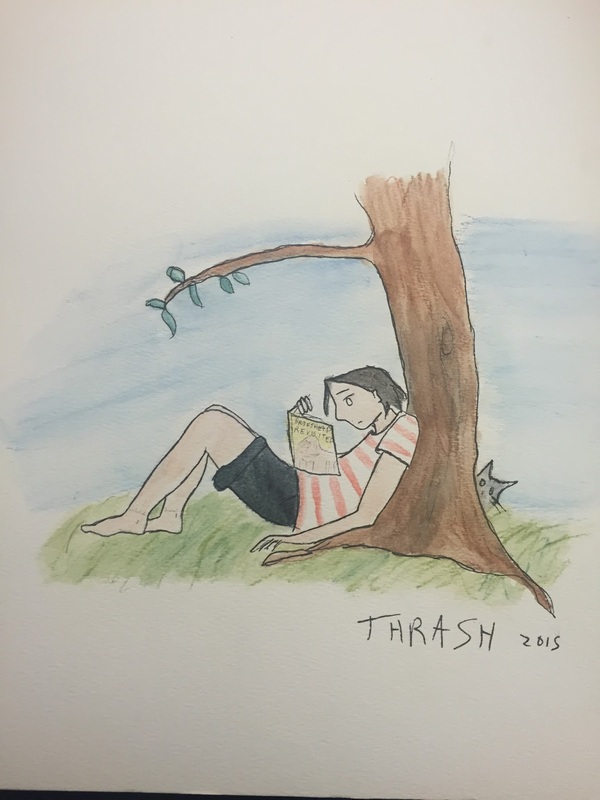 This left us with the big question everyone will want to know… what will the next comic be about? She hinted that it wouldn’t be college but she will be taking things a little slower and the readers will get a glimpse at her high school years (ending). We can’t wait to see where she takes us and will have grabby hands when the next one comes out. 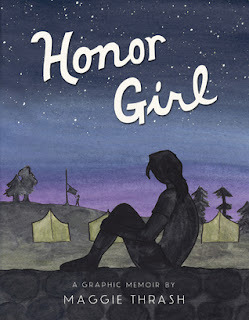 Want to be a first to read “Honor Girl”, Armchair BEA teamed up with Candlewick Press and Maggie Thrash to give a lucky reader a copy of the ARC, a color sampler and an original drawing done by Maggie herself. 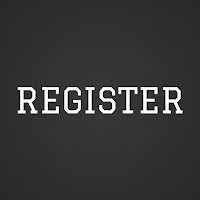 Click here to be directed to the contest. P.S. ShelfNotes asked our signature question - What is your favorite candy? 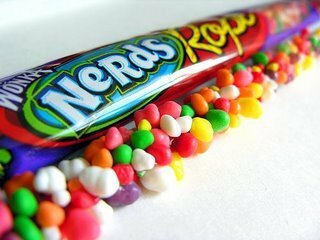 Maggie loves one of our own favorites, Nerds Rope! If you haven’t tasted this stuff, find your nearest gas station (the only place we’ve found them) and chomp away. Thank you to Candlewick Press and Maggie Thrash for the opportunity to discuss and ultimately have a fun chat with such a talented young author. We believe she will be paving the way for the future of comics, hopefully giving the courage for other female artists/authors to try a hand in this male-heavy world of comics. Where have you found it? I seriously have only found them in gas stations or in massive bulk online? !